The tour leaves Johnson City, near the Colorado border, on Saturday, June 8th, and arrives in Galena, on the Missouri border, on June 15th. 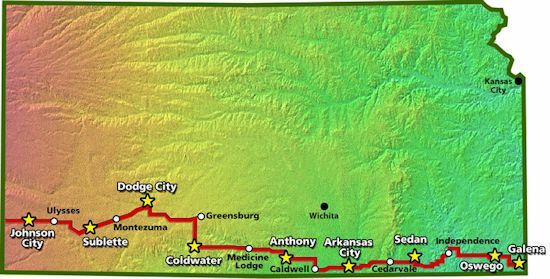 The route covers about 507 miles, with overnights in Sublette, Dodge City, Coldwater, Anthony, Arkansas City, Sedan, and Oswego. Prices for the Biking Across Kansas tour have gone up a bit this year, with the full adult tour now costing $185 for indoor lodging and $170 for tenting (up from $175/$155 last year), and other age groups going up by similar amounts. The single-day cost is now $35 (up from $32). Despite the increases, BAK is still one of the very best values in the nation. Is this a fairly flat route or does it have lots of hills? There will be hills. Looking at the route map image, you can see that the western segments are pretty flat, as is the passage through the Arkansas River valley. The Gypsum Hills (Coldwater through Medicine Lodge, roughly) will features some nice climbs, as will the southern Flint Hills region (Sedan). I expect, at some point, BAK will release a more detailed map, with elevation profiles.